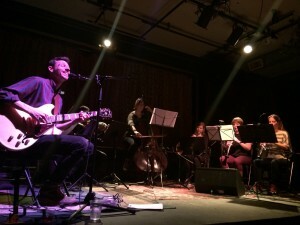 The mood was cheery and upbeat as a crowd gathered and filled the room early in advance of Paper Beat Scissors’s orchestra-backed headlining show at Sala Rosa. The performers bypassed the stage in favour of the floor which, along with the limited seating, provided a suitably intimate atmosphere. Up first was Ambroise, headed by songwriter Eugénie Jobin and rounded out by Gabriel Drolet, Frédérique Roy, and Simon Labbé, all mainstays of the local jazz scene. A hush immediately fell as the quartet spun a gorgeous web over the room, Jobin’s clear voice bouyed by tasteful guitar, bass, guitar, and accordion. Balancing between smooth drones and ambling rhythms, the mood was masterfully set with this relaxed set of simple songs. Paper Beat Scissors, while also offering a lush and immersive sound, was by contrast considerably more upbeat. Tim Crabtree’s driving guitar and yearning voice, a simple but undeniably potent combination, was swaddled with layers of additional instrumentation provided by the seven-piece orchestra at his back, elevating but never overwhelming his presence. The songs crashed like waves and broke around me, highlighted by the bobbing strings and woodwinds, tugging and rocking and ultimately leaving me clean. This entry was posted in Reviews and tagged ambroise, paper beat scissors, Sala Rosa on April 13, 2017 by CKUT Music Coordinator.